*Ding* “Ladies and gentlemen, this is your captain speaking. We just turned on the fasten seatbelt sign due to reports of some choppy air ahead. We should have it back off in about 20 minutes.” If you’ve flown, you can bet your bottom-dollar you’ve encountered at least some level of turbulence. While turbulence does make some people uneasy, understanding what causes that rough air can help take the edge off. Turbulence is defined as the unsteady movement of air (or water), and changes in wind speed or direction can be caused by any number of weather phenomena. Air moves much like water and turbulence can by created in any instance in which two different flows of air are mixed. People often think of storms as the primary cause of turbulent air, but there are other causes as well. Clear-air turbulence, which lacks any visual cues such as clouds, is a relatively common cause of turbulence. Even though this sort of turbulence is invisible, pilots and dispatchers (those who make flight plans) can use wind data to fly around areas that are prone to this type of turbulence. On hot days, thermals (currents of warm air that move upward rapidly) can cause turbulence, and flying over mountains or even hills can also be turbulent because air has to move around them, resulting in updrafts or downdrafts. It is comforting to know that pilots and Air Traffic Control (ATC) are always working together to keep your flight as smooth as possible. There is more weather data available today than ever before to help flights avoid rough air. This information not only helps pilots and ATC know what types of weather are more prone to the creation of turbulence, but also helps them see and avoid it. The weather radar in modern jets allows pilots to scan what’s directly ahead at their altitude and altitudes above and below the aircraft. Pilots and dispatchers have the discretion to fly hundreds of miles out of the way just to give you a smoother ride. Here’s a great example of an AVL-bound jet making a slight deviation en-route to avoid a thunderstorm. Additionally, pilots often provide Pilot Reports (aka, PIREPs) of flight conditions, so aircraft passing through the same airspace know what to expect or avoid — you can see some examples here and here. Given the number of planes flying, there are thousands of PIREPs every day, helping your flights find the smoothest air. That’s how your pilots often know about turbulence ahead of time and are able to climb or descend to avoid it. Turbulence is never truly as rough as it may feel to a passenger. In fact, even “severe” turbulence typically only involves altitude changes of 20–40 feet. Aircraft are built to endure much more punishment than they ever endure during commercial flights. In fact, modern aircraft are designed to handle forces 1.5 times stronger than any recorded in the past 40 years of flight. When flights re-route around turbulence, it’s largely for your comfort, as the aircraft would handle the ride just fine. No matter how bumpy your flight gets, the structure of the airplane is far from ever becoming stressed. You can see just how much the wings of modern jets like the Boeing 787 are tested here. If you’re a nervous or anxious flier, there are many things you can do to help yourself enjoy the flight. You should always try to sit where you’ll be most comfortable. Even on sold-out flights, if you let the gate agent know ahead of time that you really want a window, they’ll try to accommodate you. Make sure you bring along a movie, some snacks, ear plugs and any other creature-comforts that you’d want in any scenario where you’d be sitting for hours. There are apps and online guides (like this one) that’ll help you find other ways to make your trip as enjoyable as possible. And always – keep that seatbelt fastened when you are seated. The next time your flight encounters turbulence, loosen your grip on that armrest and remember that you’re experiencing a perfectly routine part of flight — the safest form of travel in human history. In fact, statistically, air travel has been increasing its lead as the safest form of travel for decades. So sit back, relax and enjoy the flight! (Asheville, N.C.) Asheville Regional Airport is pleased to announce that it will break ground on a five-story parking garage on October 3, 2016. The construction of a parking garage is part of the airport’s master plan to meet the growing air travel needs in western North Carolina. Passengers have been requesting easy, level and covered walking access from the parking area, and the new parking garage will fulfill these requests and enhance the passenger experience. The garage will be located directly in front of the airport’s main entrance, and will include a covered walkway from the garage to the terminal. When completed, the garage will hold a total of 1,300 parking spaces, 200 of which will be used for the rental car agencies’ ready return service, which will be located on the lowest level of the garage. The long-term lot furthest from the terminal will be closed. The construction project will take approximately twelve months to complete. During construction, approximately 400 parking spaces will be displaced. Passengers will have several parking options at the airport. First, there will still be numerous spaces in the short and long-term lots available for customer use. Additionally, the credit card lot, located just past the terminal on the right, offers 200 spaces, and a temporary lot with nearly 200 spaces directly across the street from the main entrance will be opened for passenger use. This temporary lot will be a pre-paid lot, and will offer 24/7 shuttle service to and from the terminal curb. The parking garage is a $22 million project, and capital funding was secured with a general indenture bond. This type of direct placement bond is very similar to a loan, and was contracted directly between the Greater Asheville Regional Airport Authority and Raymond James Capital Funding, Inc., the lending institution. The Airport Authority submitted Requests for Proposals for bond funding earlier in the year, and chose the proposal with the best interest rates and term. The airport is not reliant upon local tax funds to operate the airport, nor for capital funding. The bond is backed by projected revenues that will be generated by the parking garage, including lease and fees generated by the rental car agencies that use the garage. During the next three weeks, passengers should not park in the footprint of the new parking garage if they plan to leave a car in the lot past September 29, 2016 at 5pm. The footprint of the new garage will be clearly marked, and signs are now located at the entrance and throughout the parking lot detailing this requirement. Cars that remain in the footprint of the new garage after 5pm on September 29 will need to be towed to a different parking location at the airport so construction may begin. For more information about airport parking, including maps identifying each available parking area and the footprint of the new garage, visit flyavl.com. (Asheville, N.C.) Asheville Regional Airport (AVL) art gallery unveils it's newest exhibit today. Revealed is an eclectic group of works highlighting four of our region's artists. The exhibit will be on display through January 6, 2016. Featured in the Revealed exhibit, textured acrylic paintings on canvas by artist Walter Diehl, soldered glass and rock sculptures by artist R.C. Bob LaBerge, photography and encaustic on wood by artist René Roberts, and mixed media acrylic paintings by Tarah Singh. The colors and textures seen throughout the exhibit are indicative of dream-like surroundings, expressing what is seen in the mind's eye or a memory. Those traveling through the gallery will be enticed to experience their own interpretation as each piece is revealed to them. If you’ve ever flown for the holidays, during spring break, or on a peak summer travel day, you’re all too familiar with the gate agent making the announcement that the flight is oversold and they’re seeking volunteers. Most of the time, someone catches a later flight and gets a lovely incentive from the airline to do so. It’s not uncommon to hear various passenger perspectives on why or how this could happen, but it’s never a mistake. Many airlines oversell hundreds of flights as a revenue maximization tactic. It’s smart business! Here’s why. People miss flights. Most flights that are booked full never actually leave the gate full. Passengers miss flights for thousands of life-related reasons and airlines track this. Each flight is different, but airlines always mathematically estimate how many people won’t show up for a flight based on historic data and other situational information. They take advantage of this data in an effort to maximize revenues, because once a flight departs, empty seats mean lost revenue that can never be regained. A simplified example may help explain. If one flight has had two people not show up every day for a year, that flight may be marketed to sell 2 more seats than the aircraft holds. Depending on the route and aircraft type, airlines may choose to oversell by as little as one or in excess of a dozen. Again, this happens because if they only sell to capacity, and the people that don’t show up end up getting refunded, that’s lost revenue. Of course, there are many situations where airlines won’t oversell a flight at all because the odds of everyone showing up are very high. There are other reasons that your flight could end up oversold. There can always be a last minute swap to a smaller airplane for operational reasons. If there’s a cancelation or an irregular situation, airlines could overbook flights that they might not normally overbook in an effort to get everyone where they need to go. It is also possible that the weather may impact whether or not a flight can be oversold. The good news is that it is very rare for a passenger to be unwillingly removed from a flight because it was oversold. Most of the time it’s a win-win situation: when flights are missed, the airlines are able to ensure full flights, and nearly all the time, airlines will find passengers who will happily volunteer for a later flight in exchange for incentives such as some cash or flight vouchers. So listen up the next time you’re in the gate area. When you hear, “Seeking volunteers,” will you raise your hand? It could be worth it! Additionally, Allegiant today launches its “Christmas in July” sweepstakes to provide 12 lucky winners with seats on the inaugural flight from Asheville to New York City for themselves and a guest. Local travelers who would like to enter to win can do so on Allegiant’s Facebook page at Facebook.com/Allegiant. The “Christmas in July” sweepstakes is part of Allegiant’s ongoing $1 Million Summer, a promotion in which the company is giving away $1 million in airfare throughout the summer. For more information on Allegiant’s $1 Million Summer, visit Allegiantair.com/blog/million. Allegiant offers a unique travel option to Asheville travelers. Focusing on low-cost leisure travel, the company provides customers with low base fares averaging nearly half of the cost of the average domestic round-trip fare. Allegiant’s innovative business model has allowed the company to grow from one aircraft and one route just over a decade ago, to providing convenient, affordable service in over 100 communities nationwide. NO PURCHASE NECESSARY TO ENTER OR WIN. A PURCHASE WILL NOT IMPROVE YOUR CHANCES OF WINNING. Open only to legal residents of the 50 United States and the District of Columbia, and residents of any Canadian province not including Québec, 18 and older. Void elsewhere and where prohibited. Sweepstakes ends July 9, 2016. Subject to complete Official Rules at http://gofly.us/cfDZ301C0qj. Seats are limited. Price includes taxes and fees. Fares are one way and not available on all flights. Must be purchased by July 1, 2016 for travel by Feb. 14, 2016. Price displayed reflects purchase by debit card; purchase by credit card subject to surcharge not to exceed $8 each way per passenger. See Allegiant.com for details. For optional services and baggage fees, please visit Allegiant.com. Additional restrictions may apply. 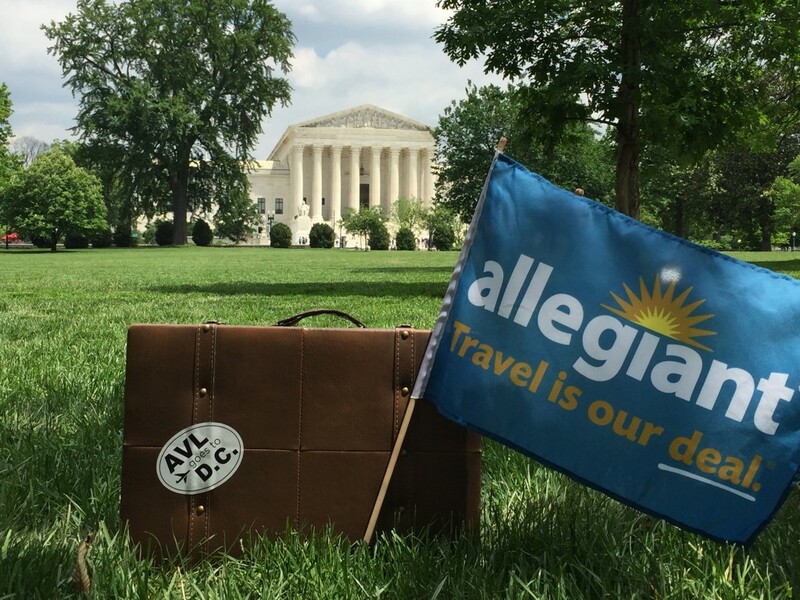 Las Vegas-based Allegiant (NASDAQ: ALGT) is focused on linking travelers in small cities to world-class leisure destinations. The airline offers industry-low fares on an all-jet fleet while also offering other travel-related products such as hotel rooms, rental cars and attraction tickets. All can be purchased only through the company website, Allegiant.com. Beginning with one aircraft and one route in 1999, the company has grown to over 80 aircraft and more than 300 routes across the country with base airfares less than half the cost of the average domestic roundtrip ticket. For downloadable press kit, including photos, visit: http://gofly.us/YFuyb. When Allegiant announced that they were starting a summer seasonal non-stop flight from AVL to Baltimore Washington Thurgood Marshall International Airport (BWI), it was great news for WNC air travelers! A quick and easy flight to the Washington, D.C. area has been on our “wish list” for many years. After the announcement, we learned that some travelers did not know that BWI is an easy gateway to Washington, D.C. So, we decided to investigate. A team of AVL staff, a representative from our Convention and Visitors Bureau, a representative from Allegiant and several local media personalities boarded the inaugural flight to BWI from AVL on May 19, 2016. Our mission? Document the experience of flying non-stop from AVL to BWI, and share the details about how easy it really is with travelers in our region. Was the experience easy? Was it efficient? Would we do it again? Yes, yes and YES! The non-stop flight to BWI from AVL departed on Thursday morning, May 19 at 8:45am, and just 59 minutes later, we landed in Baltimore. A one-hour flight – so easy! When we walked off the plane, the airport was welcoming and easy to navigate. A quick walk (literally a few minutes) later, we exited the terminal and found shuttle buses waiting for us. The BWI shuttle buses that run between the airport and the MARC station (Maryland Transit Administration commuter rail) operate every 6 minutes. We hopped right on the bus. Five minutes later, we arrived at the MARC/AmTrack station. (Side note – this train station offers connections to Washington, D.C., Philadelphia, New York City and more.) The commuter train (the “MARC Red Line”) travels directly to Washington, D.C.’s Union Station. The trip is about 30 minutes, and these trains leave the station about every hour. We waited a little while, and then hopped on the train and headed to D.C. When we got to Union Station (the train station in Washington, D.C.), we walked outside and … Tah, Dah! The Capitol Building was a few blocks ahead. We made it to Washington, D.C. in just a few hours. And everyone agreed that the trip was super easy. (Asheville, N.C.) Asheville Regional Airport (AVL) and Ashvegas.com are pleased to announce a new program titled Music on the Fly. Music on the Fly is a special podcast series presented by the Asheville Regional Airport and hosted by Ashvegas.com. Music on the Fly brings live, local music to the airport - a key gateway to and from western North Carolina. "The airport is one of the anchor organizations of our region, and we welcome thousands of locals and visitors every day through our doors," said Tina Kinsey, marketing director at Asheville Regional Airport. "Partnering with Ashvegas.com to bring local music to the local travel experience is a great opportunity for all involved." The first Music on the Fly event will take place May 20, 2016 at 4pm in the gate area of the terminal - performances will be for ticketed passengers who are waiting at the gate for their flights to depart. Featured artists include The Cheeksters/ Wham Bam Bowie Band and songstress Jane Kramer. The Ashvegas podcast, known as AVL Informer, launched one year ago, and has featured a variety of newsmakers, local personalities and musical acts. The podcast is featured on Ashvegas.com, and is available through iTunes and at www.spreaker.com/show/avl-informer. Ashvegas.com is one of Asheville's most popular and longest running independent news and entertainment websites. Started by a former newspaper reporter, the website is a go-to destination for readers who want to know what's really going on in town. From food and music reviews to breaking news and celebrity sightings, Ashvegas covers it all. With more than 13,500 fans on Facebook, more than 13,000 followers on Twitter and more than 7,500 Instagram followers, Ashvegas has a fantastic web presence and social media reach. 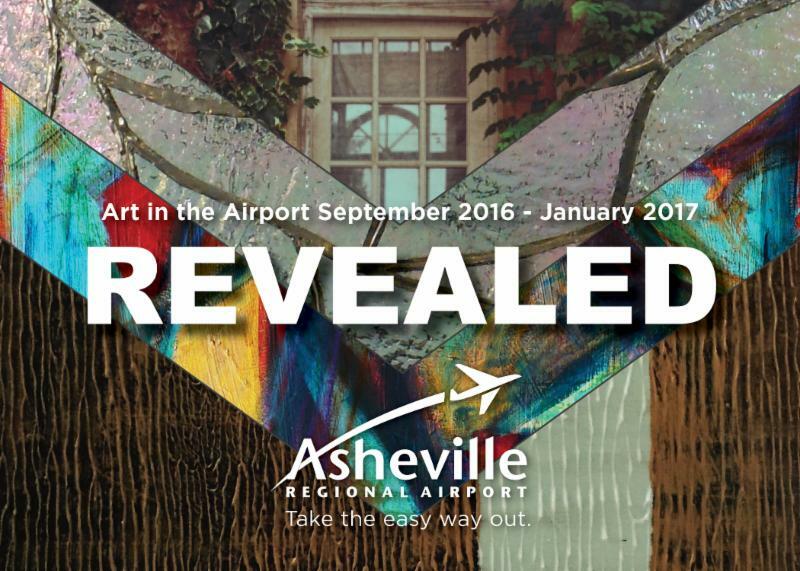 (Asheville, N.C.) Asheville Regional Airport (AVL) has a new Art in the Airport exhibit on display. The exhibit is called Reimagined and is open through September 4, 2016. This exhibit highlights the work of local artists using a number of distinct styles and mediums. A walk through the airport gallery calls you to reimagine or rethink the way you see what is on the canvas. The lines, colors, and forms can take on a new life. From metal to wood and photography to pastels, the vivid art forms have arrived just in time for the summer travel season. The five local artists that can be seen in the gallery are Carol L. MacAllister, Robert Mahosky, Hartley Meinzer, Wendy Newman, and Elise Okrend. Artwork can be purchased from the gallery by emailing art@flyavl.com. Artists who reside in any of the eleven counties within AVL's primary service market may apply for acceptance into upcoming exhibits. Details about the program, including application instructions, can be found on the airport's website at flyavl.com and click on ART + MUSIC. “Welcome aboard flight 5429, operated by PSA airlines, we’re happy to have you with us today.” Whether a road warrior or an infrequent traveler, odds are you’ve heard an announcement just like this. Why is your flight being flown by an unfamiliar airline? For decades, network airlines (you know, very familiar airlines like American, Delta and United) have used regional airlines with smaller aircraft to feed their hubs from smaller cities and to serve routes that aren’t large enough for a mainline jet. Regional airlines generally fly aircraft between 50 and 76 seats, while most mainline airlines fly aircraft with 100 seats or more. Because the aircraft have so few seats, the cost for mainline (network) airlines to operate them could make them uneconomical. Regional airlines instead operate these planes at costs that are more economical to fly. They generally don’t have some of the expenses that mainline carriers incur by virtue of flying larger aircraft. For example, ExpressJet doesn’t own any hangars that can house a 747, nor do they have the tools to work on massive 777 engines. Pilots and flight attendants generally start their careers at regional carriers and move up to mainline as openings become available. Regional airline flight crews and mechanics go through all of the same rigorous training as the mainline carriers. Some regional airlines are actually wholly-owned subsidiaries of the mainline carrier. There are nearly 30 regional airlines in the United States. Smaller airplanes don’t necessarily mean smaller businesses. Some, like SkyWest and ExpressJet, are actually larger and have more aircraft than many airlines that fly larger planes. There are many ways their contracts to fly are negotiated, but in a nutshell, the mainline airlines like Delta pay regional airlines like ExpressJet to operate flights on their behalf. The way the regional airline gets paid by the mainline carrier is subject to the contract between the two airlines, which is often broken down into groups of aircraft. A regional carrier with 30 planes can have 3 sets of 10 planes, with each set operating under a different contract for the same mainline carrier. The most noticeable difference to the passenger between a regional airline and a mainline airline is the size of the aircraft. In most cases, everything else will be the same: The aircraft will be painted in the mainline airline’s colors and will fly routes for that airline as if it were one of their own. The mainline carriers want passengers to experience the same product benefits on their regionals as they do on their mainline flights. There are now more regional jets with features like first class and Wi-Fi than there have ever been and the number continues to grow. Without regional airlines, there would be hundreds (yes, hundreds) of cities that simply wouldn’t have air service. Smaller aircraft allow the airlines to fly to smaller cities and to have added schedule flexibility. Regional airlines have been an integral part of the air transportation network for decades and will continue to serve smaller cities well into the future. 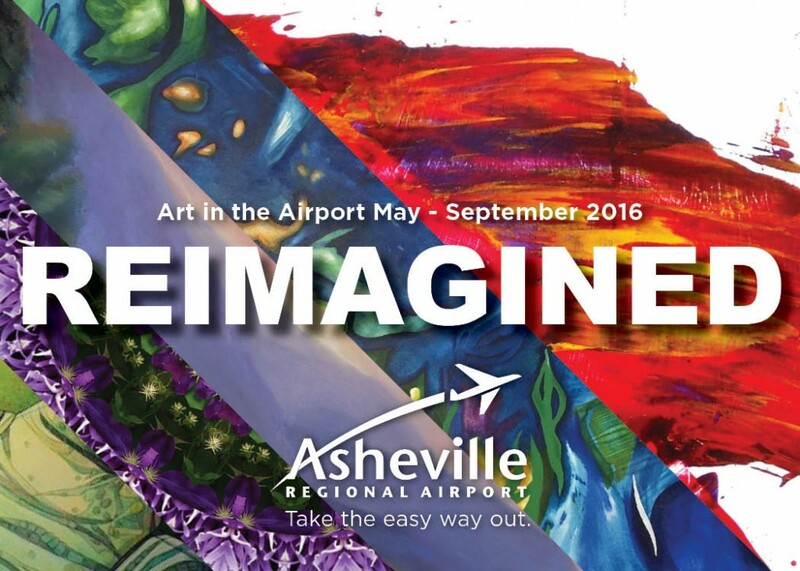 (Asheville, N.C.) The Student Artwork Showcase, the newest exhibit at the Asheville Regional Airport Art Gallery, is on display until May 1, 2016. This showcase highlights the creativity of students across our region. This exhibit displays a variety of mediums and techniques by students attending Carolina Day School, ranging from grades kindergarten to twelfth grade. The bold uses of color in many of the pieces are highly contrasted by the traditional black and white still film photography on display. The students' work varies in medium, from pen and ink, pottery, painting, to paper collage. Overall, the showcase is a bright escape into a creative point of view. Asheville Regional Airport's Art in the Airport program is pleased to feature an annual Student Artwork Showcase in our Art Gallery, highlighting the creativity of students across our region. If your school would like to participate in the Student Artwork Showcase, please visit flyavl.com and click on Art + Music in the Social Hub to learn more.